Latvian metal band Relicseed will release the CD version of their second studio album “Slaughterhouse” recorded at Tranzformer Studios (Burbank, CA). The record was engineered and co-produced by Bryan Calrstrom who passed away on January, 2013 and left the record unfinished. The record is mixed by Dirk Kloiber at “Hybrid Sound Visions” (NYC), mastered by Maor Appelbaum at “Maor Appelbaum Mastering” (LA, CA). The band has also started to shoot the video for the album opening track “Serial leader”. It will be presented on July 25. Relicseed is the first Latvian band which is going to tour in the US. 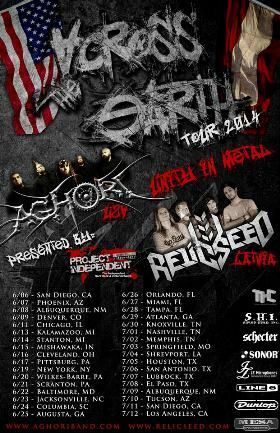 “Across the Earth” tour together with locals Aghori will present “Slaughterhouse” live in more than 20 cities starting from June 17. The band will continue touring in September and play as the support act for the biggest international metal showcase Project Independent. The full tour schedule will be available on www.relicseed.com. Since the debut album (60 minutes of a dream, 2010) Relicseed has been developing in the US market. So far a lot has been done by the band itself but at this point musicians need some help from friends and fans all over the world via indiegogo.com. Everyone is invited to read the story and contribute here.